Non Genuine products available for $259.60 cheaper. The 3 x Genuine Fuji Xerox DocuPrint CP115W CP116W CP225W CM115W CM225FW Black Toner Cartridge High Yield CT202264is just one of thousands lines we supply. With such a huge range, you are sure to easily find all the cartridges you need for all other printers you may have. With our superior buying power, we can pass on the great savings to our valued customer! 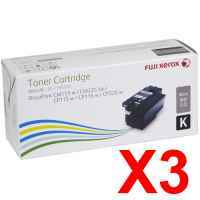 Buy High Standards and Low prices 3 x Genuine Fuji Xerox DocuPrint CP115W CP116W CP225W CM115W CM225FW Black Toner Cartridge High Yield CT202264 here at HotToner and save!